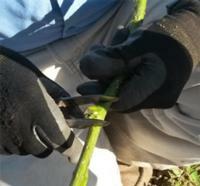 Elite clonal rootstocks will be selected for field trial evaluation which will be conducted at commercial orchard sites and UC Research and Extension Centers in the Sacramento and San Joaquin valleys. In 2015, the first rootstock field trial was established at the UC Davis Armstrong field station. 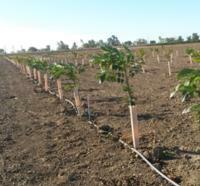 The trial contains 5 elite putative disease resistant rootstock genotypes along with 3 industry standards (RX1, VX211, and Vlach) for a total of 700 trees. The majority of trees in the Armstrong field trial were budded with a commercial English scion. The remaining non-budded trees will be grafted in the spring of 2016. Fig. 1. 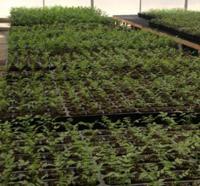 Young greenhouse plantings. Fig. 2. Commercial English scion. Fig. 3. 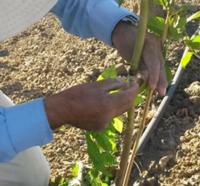 Budding trial rootstocks. Fig. 4. Rootstock trials at UC Davis Armstrong field station.